The Hawaii Undersea Research Laboratory (HURL) has enabled scientists to determine that a long-term shift in nitrogen content in the Pacific Ocean has occurred as a result of climate change. Researchers from the Lawrence Livermore National Laboratory (LLNL) and the University of California – Santa Cruz analyzed deep-sea corals gathered near the Hawaiian Islands using the HURL Pisces V submersible. They observed overall nitrogen fixation in the North Pacific Ocean has increased by about 20 percent since the mid 1800s and this long-term change appears to be continuing today, according to a study published recently in the journal, Nature. Additionally, HURL’s submersible and crew obtained the cover image on this edition of the prestigious scientific journal. Using chemical information locked in organic skeletal layers, the team used these ancient deep corals as detailed recorders of changes at the base of the open Pacific food web over the last 1,000 years. This represents the first detailed biogeochemical records for the planet’s largest contiguous ecosystem. This type of sample is only available using deep-diving submersibles, such as those operated by HURL. According to HURL’s biologist Christopher Kelley, “HURL’s most basic function is to provide access to the deep sea. In so doing, HURL has played a critical role in this and other important projects ranging from the discovery of historically important cultural resources, understanding the formation and geologic history of the Hawaiian Islands, discovering new species of deep sea corals and sponges, discovering new deep sea communities in the Papahanaumokuakea Marine National Monument, and surveying deep water pipes and pipe routes for private companies working on providing the islands with new renewable energy sources”. The Pacific contains the largest contiguous ecosystem on the planet. Time series data near Hawaii have shown dynamic decadal scale variability. But the new records from deep corals now show that the decadal-scale time series changes are really only small oscillations superimposed on a dramatic long-term shift at the base of the Pacific ecosystem. “This also has very significant implications about how we understand, and perhaps, can better predict effects of global warming in the Pacific, but also likely in other subtropical regions,” Tom Guilderson of LLNL said. HURL specializes in providing scientists with the tools and expertise they need to investigate the undersea environment, including submersibles, remotely operated vehicles, and other cutting edge technologies. Originally established by Cooperative Agreement in 1980 between NOAA and UH, HURL has entered a new chapter with the recent end of NOAA base funding as a result of the federal fiscal situation. In recognition of HURL’s unique capabilities and value to the state, nation and scientists worldwide, UH and SOEST have been providing stop gap funds in the hopes that the budget situation will improve. 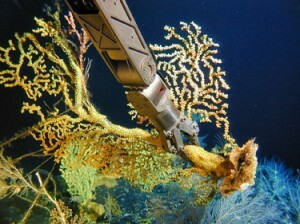 As the only U.S. deep submergence facility in the Pacific Rim, it is hoped that HURL will be able to continue to support highly-rated, peer-reviewed proposals to conduct undersea research in offshore and nearshore waters of the main and Northwestern Hawaiian Islands and waters of the central, southwestern, and western Pacific, including the new marine national monuments. With emerging interest in marine resources of the Pacific and renewable energy from the sea, HURL’s contributions could continue to play an essential role in scientific research and advanced technology. Photo: Samples of Hawaiian gold coral Kulamanamana haumeaae, which can live for thousands of years, were collected during a HURL Pisces V submersible dive (robotic arm of the submersible is visible here). Credit: UH Hawaii Undersea Research Laboratory, DSRV Pisces Pilot Max Cremer.